Major infrastructure investment is necessary in order to increase private investments and to safeguard high economic growth rates in the long term. President Duterte´s violent crackdown on drug trade, which has led to the extrajudicial killing of several thousand people, still raises international concerns over human rights and the government´s commitment to the rule of law. This, and uncertainty over some economic policy initiatives (e.g. curb of rice imports and new labour laws) have increased uncertainty among investors. Mid-term elections are due to be held in May 2019. The security situation in the largely Muslim populated southern part of Mindanao remains tense, with the threat of terrorist attacks ongoing. However, further progress has been made in the peace process between the government and separatist groups in the region. In a referendum held in January 2019, in the mainly Muslim populated areas, a majority of voters approved a scheme to enhance regional autonomy. Since 2012 economic growth has been persistently high, driven mainly by private consumption, which accounts for about 70% of the economy. In H2 of 2018 GDP growth decreased as higher inflation (higher food, especially rice prices) impacted private consumption, while infrastructure bottlenecks affected private investment. 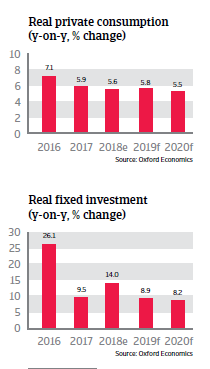 In 2019 and 2020 economic expansion will slow down further as fixed investment growth decreases (due to higher interest rates and declining investor confidence affected by uncertainty over future policy initiatives). Additionally the negative contribution of net exports to GDP (as imports of goods and services outweigh exports) will impact growth. 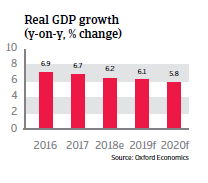 That said, the annual GDP growth rate will remain above 5.5%, mainly supported by household consumption (remittances account for more than 10% of GDP) and government expenditures. Inflation is expected to decrease again, to 4%, but it will remain higher than in previous years. Massive shortfalls in infrastructure have so far prevented more investment in manufacturing. In order to diversify away from services, the Duterte administration is heavily promoting infrastructure projects, with related spending expected to increase from 5% of GDP in 2017 to more than 7% of GDP in 2022. Indeed, rail networks, ports, roads, airports and power generation developments are necessary in order to increase private investments and to safeguard high economic growth rates in the long term. With the improvement of the tax base due to a tax reform the fiscal deficits and public finances are expected to remain at an acceptable level, supporting continued government spending. 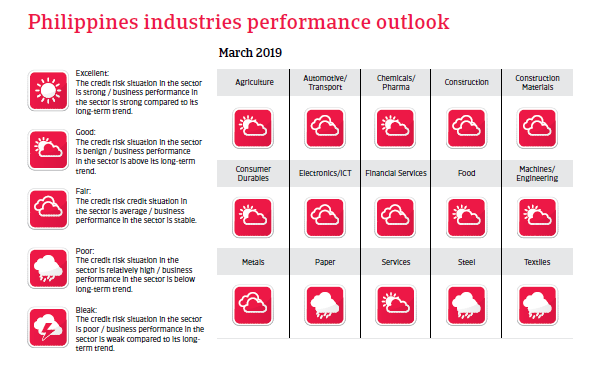 The external macroeconomic situation is good, with manageable foreign debt (19% of GDP; 68% of exports of goods and services expected in 2019) and ample liquidity.